We know that the text ads are those appearing on google SERPS and on any google network, used by businesses for product or service promotion. Expanded text ads (ETAs) are the successors of standard text ads; they allow displaying more content and efficiently managing the same. They allow two headline fields, 30 characters in each of the headlines where the allowed limit for description is 80 characters. URL is calculated from the landing page and redirected paths so as to allow users to predict where they would land on. You can check the image above for differences between standard text ads and ETAs. You can see the above example of ETAs. Headline one and headline two are separated by a dash. “Buy your tickets now” is the description. ‘all-inclusive’ and ‘deals’ in the URL are paths used to derive the URL. This launch is aimed at providing more information to mobile users and has shown a rise of 20% in click through rate in the initial tests conducted. Answering to why second headlines get truncated, google recommended just 33 characters for headlines, as a good practice, which one can verify using the ad preview tool before launching the same. 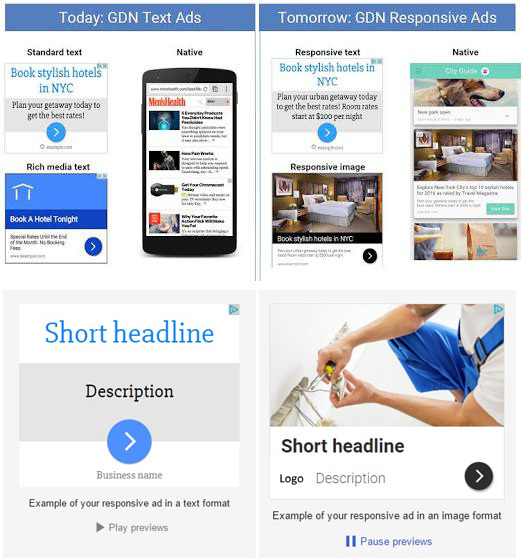 Google responsive ads display is an advancement to ETA; google generates these from the details what you give them. Google Responsive ads specs include headlines (a short one of 25 characters and a long one of 90), description (of 90 characters), landing page URL and image; these are what you provide google. It doesn’t mean all 4 items would be used every time but google would do the best display for the device. 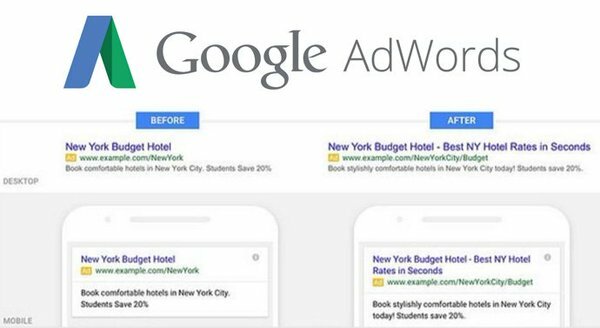 The responsive ads Google rolled out, can be set up using the drop down +Ad in Responsive display ads AdWords. These automatically fit themselves onto any device used for the website launch. You can check a few previews when you create these responsive ads Adwords. You can set bids for different smart devices, using google smart bidding tool. Choose an ad group, upload the landscape image file of size 1MB. Recommended dimension is 1200*628. You can use square images too if needed; check the image specifications included here. Provide the short and long headlines, and the description. Once your ad is approved, you can check its performance in a week or so. Well, you’ve now got an expert knowledge on what Google responsive ads are and how to create them. Hurry up, it’s time you have them for your ads because the standard ones are no longer valid. Ask us at Qeagency, if you need any assistance or have any questions!